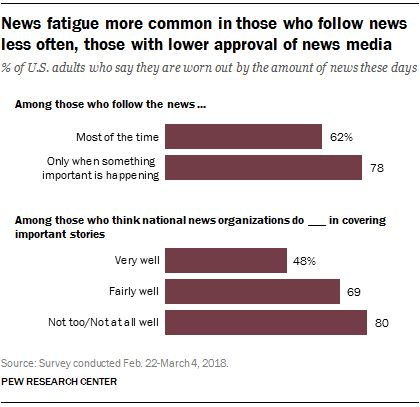 Those less favorable toward the news media are also the most “worn out.” Eight-in-ten of those who think national news organizations do “not too” or “not at all well” in informing the public are feeling this exhaustion. This is somewhat higher than among those who say the news media do “fairly well” (69%), and much higher than for those who think news organizations do “very well” – of whom 48% say they are worn out by the news and 51% say they like the amount they see. 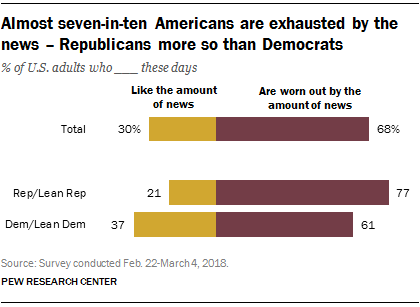 This relationship between attitudes toward the news media and fatigue holds even after accounting for Americans’ political party affiliation. Some demographic groups – most notably white Americans – are more likely than others to feel exhausted by the news. Nearly three-quarters (73%) of white Americans express fatigue with the amount of news, much higher than among both Hispanic (55%) and black Americans (55%). Women are also somewhat more likely than men to feel worn out (71% vs. 64%, respectively). Those ages 65 and older are slightly less likely than those who are younger to express a sense of exhaustion with the news. Note: The full methodology and topline can be found here (PDF).